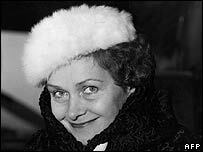 Dame Elisabeth Schwarzkopf, one of the most admired classical singers of the 20th Century, has died at the age of 90. James Jolly, editor-in-chief of Gramophone magazine, recalls interviewing her in 1990. It was the closest I can imagine to coming face to face with one of those great Hollywood actresses. She had this aura of someone with incredible self-belief in her art and her artistry. To meet her was kind of scary and rather wonderful at the same time. Schwarzkopf, says James Jolly, had "a fabulously beautiful voice"
What made her so special was the combination of a fabulously beautiful voice, a very keen intelligence and a desire to do something different. To hear her sing a Schubert song was to hear somebody who had explored all the possibilities of the words and the poetry. She'd thought every single phrase through and had enormously high standards. For her, every note had to be thought about and worried about and attended to. When she started teaching she was very tough - she would literally stop people every note. Watching her masterclasses was a bit like watching a car crash. You didn't really want to, but at the same time you felt you had to. But she relaxed later on and became a little less draconian. She wasn't a diva in the sense that she threw tantrums and all the rest of it. She was a diva in the true sense of the word - a truly great artist who brought the music to life. She stopped singing in the 1970s, but such was the integrity of her performances that anyone interested in Mozart or Strauss can't ignore her contribution. For many she is the definitive Marschallin, one of the great Countesses in Figaro, one of the great performers of Richard Strauss's Four Last Songs. Her artistry is such it will survive any sniping [about her alleged Nazi past]. She was a singer, after all, not a stormtrooper. I think her place in history is absolutely assured.